Hello little Pumpkin Pies ! We are working on one of our most famous events : Pumpkin Town ! And this year is special. Oh… why? 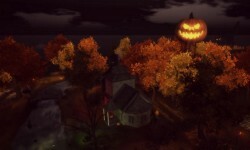 Pumpkin Town celebrates it's 5th Birthday! 5 years of spooky things! Like every year we will have shops available in our town. First come first served! But we will also have a few market stalls, but hurry they are small and we won't have many! We can only accept 25 shops. You can also be present if you don't have a shop and want to offer a special freebie. We will have a special spot for that. b. Maximum 50 prims. Then we will ask you minimum fee of 1000 L$. For the entire month (1st october until 31 october). 6. No objects outside of your shop. Your fees and donations help us organize this and helps to continue Pumpkin Town the next year. So … are you interested? The fill the form bellow. We will take the 25 first merchants who will fill the form.